The West course at Royal Melbourne Golf Club is generally acknowledged as the best course in Australia and the finest design of Dr Alister MacKenzie despite the fact that he never saw it in its completed form and never referred to it in his published writings. Born of that productive two months in 1926 when Royal Melbourne had commissioned the Doctor on the advice of the R&A, it was completed in 1931. The club that has for more than 70 years nurtured their gift from MacKenzie and Morcom, was in fact formed 35 years before his visit. In May 1891 The Melbourne Golf Club cabled the Royal Eastbourne Club in England for 30 sets of clubs with which to equip their founder members. By 1895 the club received the Royal appendage and the heaths of Sandringham were selected for the club’s new site on 1898 with play commencing in July 1901. Royal Melbourne therefore became the first golf club in what has come to be known as Melbourne’s Sandbelt. Precisely which courses constitute membership of the Sandbelt clubs is traditionally a matter of debate but the core consists of seven: Royal Melbourne, Kingston Heath, Metropolitan, Commonwealth, Victoria, Yarra Yarra and Huntingdale. I was brought up in the sand belt and relished opportunities to play RM West. I then had the luxury of playing Winged Foot over several years and it struck me that RM dines out on the composite course, WF does not. Each 18 stands on its own feet, both courses in the USA top 50 The composite is not a fair marker. My issue with the ranking is how the supposed best course in the country can have a genuinely nothing hole like 15th, or a series of OK holes from 12 to 16. And there is a difference in condition of composite and non composite holes. Don't get me wrong - it is wonderful golf. It is just not the best 18 hole layout in Australia and it is not the 6th best course in the world. I made it finally! Magnificent :) A massive thrill, honour and privilege to have played here recently. 10 years ago when I last visited Royal Melbourne they were in the middle of the worst drought in history and had severe water limitations. In fact, Royal Melbourne suffered, as they didn’t have their own water supply as did some of the surrounding courses. I did play it back then but this recent visit was to be the first time I’d seen it with grass. Not so long ago RMGC decided to re-turf the course with a couch grass partly due to ease of managing it and partly due to the fact that it essentially increases the length of the course given the limited roll out allowed by couch grass. This was definitely a success. The turf leans to the sticky side and severely limits roll out and ground game on such a traditionally fast and firm course. Given how much I personally love firm and fast playing surfaces and the ability fine grasses allow utilization of the ground game I’d personally question this choice, at least from a playability perspective. However, they of course had solid reasoning for this and wanted to maintain the championship test that Royal Melbourne is even with the distances the young guns are smashing it these days. Naturally we are picking at straws here as Royal Melbourne remains the best course on the best property with the strongest routing in Australia and a serious case can be made for it being the best in the world. The West Course offers the ultimate variation of holes with literally one amazing strategic hole after another. It delivers me as much challenge as I can take plus more but remains really fun. I still feel I need about 100 plays in order to truly figure it out which is a good thing and after a round there I most certainly want to jump right back out onto the course. I was so pleased to see it in great shape this visit and I no longer have to wonder what it looks like with actual turf. Some of the things that always stand out about this magnificent place are the wonderful Mackenzie bunkering and fantastic undulated and lightening quick greens. Not sure if there are really any easy putts out there, you are required to use tons of creativity, feel and pace control to putt the greens well and some of the results will leave you shocked or provide an adrenaline rush if you manage to get it close or sink it. If golf could always be this much fun…sigh! I feel like almost every hole is a favorite hole but have to say their signature hole, the par 3, 6th is really a perfect hole. The green sits so naturally into the hillside as does the bunkering, it’s as if they just walked up and put the flag in. On second thought, all their greens sit perfectly into the landscape and natural surroundings. Royal Melbourne is one of those few courses that are worth a trip across the world for the opportunity to play it. If the opportunity ever arises, you won’t regret it, stronger yet, you will never forget it if you make the trip. Royal Melbourne (West) continues to be number one in the Australian rankings. This is due to the fabulous piece of land the holes sit on, but more so the genius of the green complexes. It certainly feels like the golfing cathedral of the southern hemisphere, armed with the ability to break a man’s heart as he begs for more. The course continually asks for heroic approach shots judged to perfection, or face almost impossible ups and downs to save par. It’s Australia’s toughest examination of your skill set. A golf course ranked in the top ten in the world should be a special place and Royal Melbourne is. Like many great designs including Pine Valley and Sand Hills, the course has wide open fairways that are playable for the average golfer, yet demand the more skilled player to drive the ball into dangerous corners to get close to the flags. It is also compared to Pine Valley because it is a “second shot” course. Like Pine Valley, the first thing that strikes you when seeing Royal Melbourne is the scale of the course. It has a “big” feel to it with holes routed around big sand dunes, forced carries over bracken fern and sweeping fairways with big doglegs. 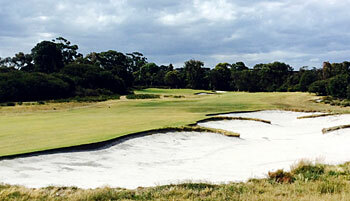 The World Atlas of Golf describes Royal Melbourne as a “kaleidoscope experience of obstacles and emotions.” I also very much liked the West’s tenth hole, a 279-meter par four which has a “big bertha” style bunker protecting against those who dare to shoot directly for the green. Nobody rings a bell when you get to one of the greatest golf holes in the world. There also isn’t a sign telling you; there doesn’t need to be. You just know it’s a fabulous hole because it bowls you over. The tenth is a hole like that. In addition to their fabulous golf course, the members and club staff are very welcoming and warm. You give it only 5 stars ? Top 10 course in the world. I'd be interested in how you rank a golf course ? I assume John ranks a course by forming his own opinion and not simply looking at the rankings to see what mark he should award it. I was fortunate to get on Royal Melbourne West as a extra student when our university colleges held their competition there once. A long time ago in a golf course far far away.... It was early autumn and the hot summer had baked the course. The architecture and some of the individual holes were great and the greens put my golf to a severe test, which I admit I failed. It was a great experience and I highly recommend playing RM, and the other Melbourne sand belt course if you ever get the chance. What to say about the finest golf course in the Southern Hemisphere?Let’s start with it being a MacKenzie textbook on strategic golf. Max Behr’s line of charm is here in spades. Not surprisingly, the dogleg hole offers the best opportunity for the strategic method and here Mackenzie has built an even dozen doglegs. Some go left, some go right, some are sharp, some are subtle, some are around bunkers, others around trees, but all force the golfer to decide how much risk to take on to enjoy the reward of the best angle into the green.Royal Melbourne is also a textbook on routing. Routing is an often overlooked, but nonetheless critical aspect of golf course design. Most golfers can easily name their favorite holes, but few can identify their favorite routings. As at many of MacKenzie’s courses, the holes go in every direction, both providing variety in the often windy conditions and offering great variety in hole design. The holes flow naturally and in only one case is it not obvious how to locate the next tee. The members of Royal Melbourne—all 1800 of them—are to be congratulated on preserving almost all of MacKenzie’s fine work. The seventh green is not original, and the green on #12 has been relocated, but these changes were both made over half a century ago. Since MacKenzie was not around for the construction of many of his Australian designs, the look of them can be different. Here it’s more rough-hewn. The grass around the bunkers is ragged, the fairways have a brownish hue and the rough fades to complete brown.I have not played the East Course, which includes 4 holes that are swapped with the West’s 13-16 to create the composite course used for tournaments. While 13-16 are not the strongest holes on the course, they don’t detract at all from the overall experience.Members believe that the return of Sutton grass—a fescue mixture not used on many other courses—has bolstered the course’s reputation. Conditions—firm and fast—were superb in March, 2015………..as was everything else at what is one of my half dozen favorite golf courses in the world. Wow!! what a course. I played here the day before the Lions test in Melbourne and had a brilliant day out. The greens were the fastest I've ever played. The standout holes for me were the 5th , 6th and 17th but very few weak holes. The fairways were very generous but not the case for the 2nd shot. I would love to play again but the 12000 mile "commute" might prevent that. Australia's best and most established course by a mile - world class. Deserves it's Top 20 status and being a Melburnian and having been lucky enough to play a lot of the worlds best golf courses including all of those on Long Island, NY and Pine Valley etc this stacks up with the best of them. Shinnecock and Pine Valley better but RM has it all over places like Winged Foot, Bethpage, Merion, etc for pure greens, bunkering, shot selection and some of the best Par 3s (#5 and #7) short Par 4's (especially #3 and #10) and great blind long Par 4s (#6, #11, #17 and #18 for sure). The need to cross a main road to play 4 holes sux and is the main thing that keeps this from a Top 10 in my view. Best course in Australia "by a mile"? Have you played Metropolitan or Kingston Heath? Yes, the West course has some amazing holes, but its permanently in a wretched condition. Also, which course are you reviewing? The West, the East or the Composite? Both the West and East have a number of week holes, and the members cannot play the Composite. The Composite in great condition might clinch the title of Australia's best if, and its a BIG if, it was presented like some of its sandbelt neighbours. And of course if anyone could play it.